To access the project list click on the InLoox PM or InLoox now tab. 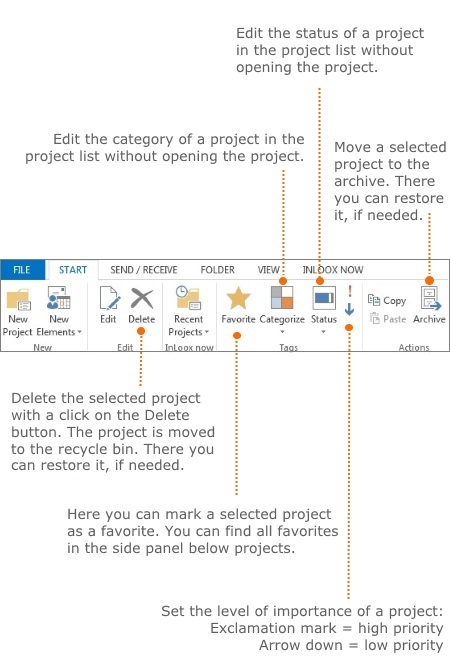 Click on Projects in the Outlook ribbon afterwards. Admins can individually define both, categories as well as different specifications of the status, in the InLoox options. Double click on a project in the project list or right click on the project to open the context menu. Then choose Open Project from the menu. Double click on an empty space in the project list or right click to open the context menu. Then choose New Project from the menu. The context menu provides you with almost all basic features that are also available on the InLoox Ribbon. To open the context menu right-click on the project list. For more information on how to structure the project list see Create and edit custom view. F2 – Create a new project. 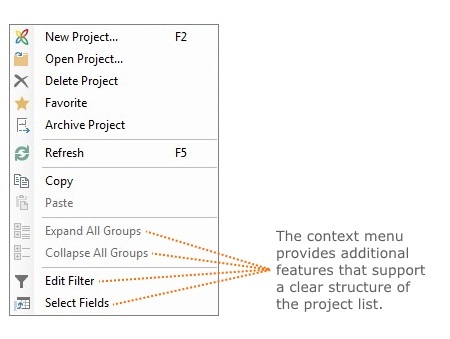 F4 – Refresh the project list. CTRG+P – Print the project list. CTRG+C – Copy a project into the clipboard. CTRG+V – Paste a project from the clipboard to the project list. Selected project list features • Copyright 1999-2019 © InLoox, Inc. All rights reserved.